After trying out the Tropic Skincare Supergreens serum I tested out a new set from Tropic Skincare to help you sleep better. The products come in a set for £10.00 which you can buy here. The products are called the So Sleepy Range. 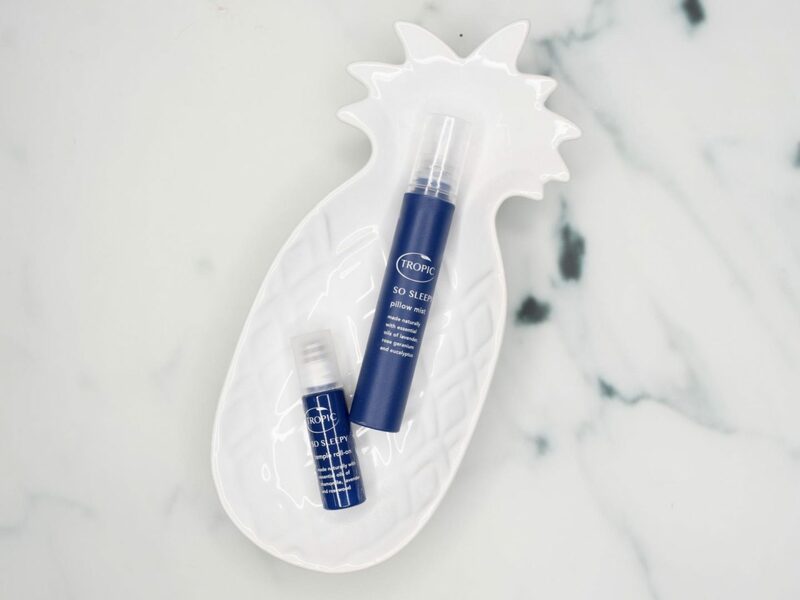 First up the SO SLEEPY temple roll-on (5ml) and also the SO SLEEPY pillow mist (15ml). Apparently the peaceful, calming pillow mist and temple roll on will have you drifting off to your best slumber ever. On one hand, I always sleep terribly as my neighbours are horrible and make so much noise from 10.30pm until 1.00pm pretty much every night. So I could use some sleep assistance. On the other hand, I have tried so many other pillow sprays and either the spray mist was so dense my pillow was soaked or they didn’t do anything at all. WHAT DOES THIS COLLECTION CONTAIN? For anyone in need of a deeper, more relaxing sleep. For frequent travellers and those with a busy lifestyle. I was surprised to the point of being shocked that firstly, the mist is an actual mist for once, so my pillow wasn’t soaking wet after one spritz. Then I realised that I actually liked the scent, and it smells calming and spa-like. I used the temple rollerball product on my wrists rather than my face as I use so many chemically facial products I didn’t want to cause a rash, it works fine on my wrists, although I do sleep with my hands quite close to my face, so that does help. After using both products for 3 nights in a row and actually managing to fall asleep fairly easily despite the previously mentioned neighbours from hell making sounds akin to elephants clog dancing, I realised that this stuff does actually work! I am not sure if the scents make you feel relaxed, and when your mind is calmed it drifts into sleep easier? That’s all I can assume. I really don’t care how it works, just that it actually works. With essential oils of vanilla, rose geranium, frankincense, chamomile, rosewood, rosemary and lavender. These specially selected essential oils have calming, stress relieving properties to help relax the mind. If you have trouble sleeping at home, when you travel or on planes, this is perfect and really does work. If you are quite a stressed person you can also use the rollerball on your temples or wrists throughout the day when you feel stressed to calm you down. You can use this when you are pregnant or for children (the pillow spray, not the temple roll on for small children) which is a nice natural alternative and therefore safer. I have unfortunately run out of the pillow spray now and, while I am still using the temple roll on, I do prefer the pillow spray and going to pick up some more when I can as it helped me so much.